Barcelona inflicted a second successive Champions League defeat on Tottenham with this resounding victory at Wembley. A needless charge from his goal led to Hugo Lloris gifting Philippe Coutinho the opener, before Ivan Rakitic struck a superb volley from the edge of the penalty area to extend the lead. Harry Kane and Erik Lamela both scored for the hosts in the second half, but a brace from Lionel Messi, who had earlier hit the woodwork, secured a deserved victory for Barca. With no points on the board from two games, Mauricio Pochettino’s players now face an uphill battle if they are to get beyond the group stage. 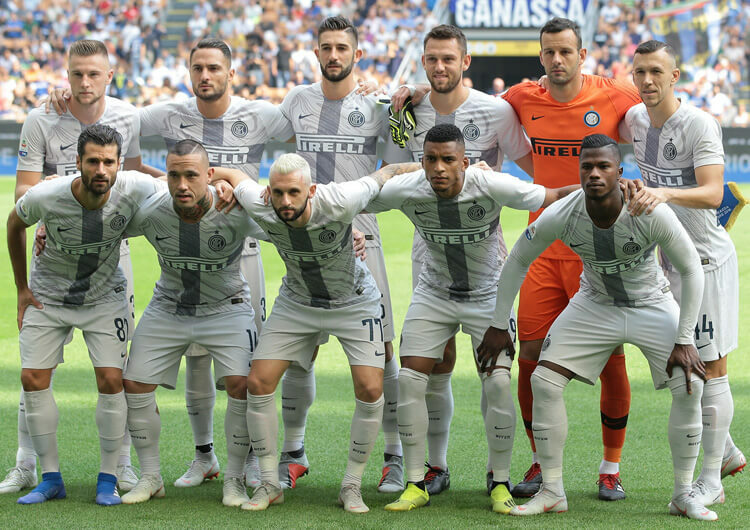 Mauricio Pochettino continued with a 4-2-3-1 structure, but made six changes to the side that lost away to Inter Milan in their opening game of Group B. Hugo Lloris returned in goal, with Kieran Trippier and Toby Alderweireld also coming into the back line. Their double pivot also changed, as Harry Winks and Victor Wanyama replaced Eric Dier and the injured Mousa Dembele. Lucas Moura took the place of another absentee, Christian Eriksen. An early decision from Lloris to leave his goal in an attempt to disturb a defence-splitting pass from Lionel Messi to Jordi Alba proved fatal, gifting Philippe Coutinho the opportunity to strike into an empty net within the opening two minutes. Spurs tried to settle in possession after conceding, but Winks, Wanyama and Moura struggled against the aggressive counter-pressing of their opponents’ midfield. 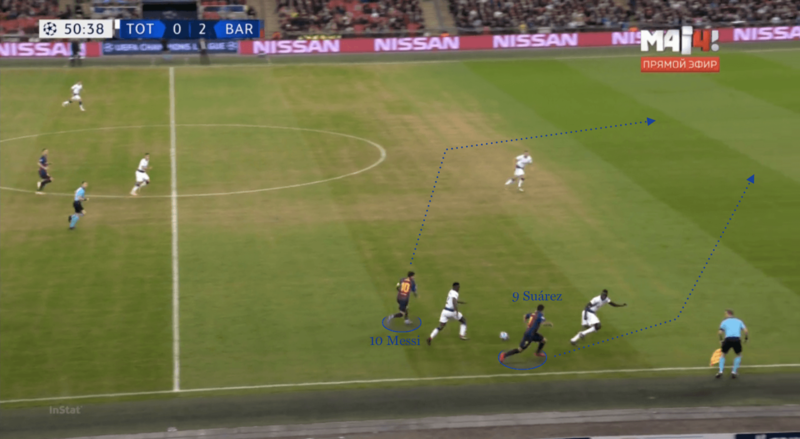 To improve their control, the midfield frequently looked to play back to provide the back line with important possession – this in turn improved their possession in the middle third, which worked to stifle the fluidity of Barcelona’s attacks.  Trippier moved higher from his right-back position throughout the first half, while fellow full-back Ben Davies remained far less adventurous on the left. Davies’ deeper role helped Spurs deal with Messi during moments of transition, as the Argentine had less space and was put under more immediate pressure as he received the ball. Trippier could draw left-back Alba out on the right side, and with Coutinho moving inside when his team was in possession, Moura could also move inside to occupy the space between Alba and left centre-back Clement Lenglet. 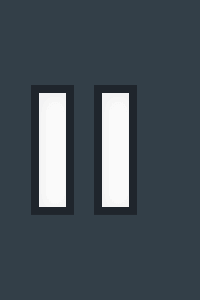 Trippier could then play Moura in behind, and Harry Kane could attack subsequent balls into the box with only one central defender to deal with. Despite looking far more settled, Tottenham fell further behind to a stunning strike from Ivan Rakitic. The hosts reacted by briefly creating momentum in possession, and right-back Nelson Semedo was fortunate not to divert Son Heung-min’s cross into his own net. 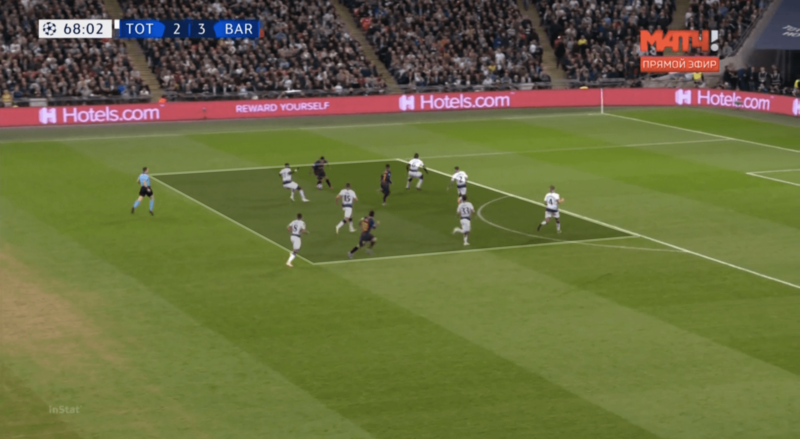 They couldn’t capitalise on this brief passage of play, though, and Barca’s aggressive counter-press proved too quick and intelligent for the Spurs midfield unit. Pochettino’s players dropped into a compact 4-4-2 mid-block, hoping to keep the score at 2-0 for the remainder of the first half. Barca transitioned into attack far quicker after the interval. Messi continued to drive at the Spurs back line, looking to capitalise on the growing space that Davies’ now higher positioning was creating. The number 10 hit the post twice early on in the second half, but it was Kane who next found the back of the net. The England international ended a free-flowing counter-attack by curling his effort into the far corner following a fine piece of disguise that fooled Semedo. The game entered into an unorganised state following his goal, with neither side able to create effective overloads or sustain possession against the other’s intense press. After Messi scored to reinstate his team’s two-goal cushion, Eric Dier was introduced to central midfield – and his presence allowed the full-backs to push higher and increase the defensive protection against potential counter-attacks. Dier dropping into the back line almost created a back three, and as Winks had also dropped to help progress the ball into midfield, Spurs had additional numbers to stop Barca’s right-sided transitions into attack and could sustain more secure spells of possession. Tottenham’s recovery runs were also boosted by extra players, which in turn reduced the effectiveness of Barca’s transitions on the break. Suarez and Coutinho started to drag their markers across the pitch, which put more pressure on the hosts’ defensive discipline. Spurs nevertheless dominated the final proceedings, consistently working the ball into the final third before falling prey once again to Messi, who clinically put the game to bed. When Tottenham had possession, right-back Kieran Trippier moved much higher than Ben Davies on the left, allowing Lucas Moura to occupy one of Barcelona’s central defenders. Harry Kane could then attack the penalty area against only one central defender. Spurs dropped into a 4-4-2 mid-block, as Barcelona dominated the ball. 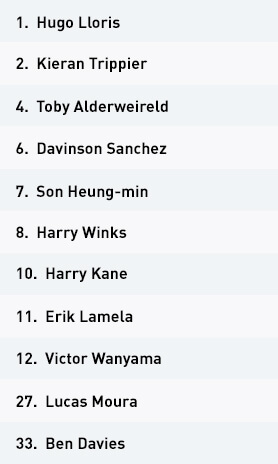 Son Heung-min would often step higher from midfield, joining Kane as a central pairing, ready to counter in behind. Tottenham condensed and recovered more efficiently once Eric Dier was introduced for Victor Wanyama. The England international added to his team’s defensive presence during moments of transition. In possession, Philippe Coutinho’s early movements inside for Barcelona created space for Jordi Alba to attack from left-back. 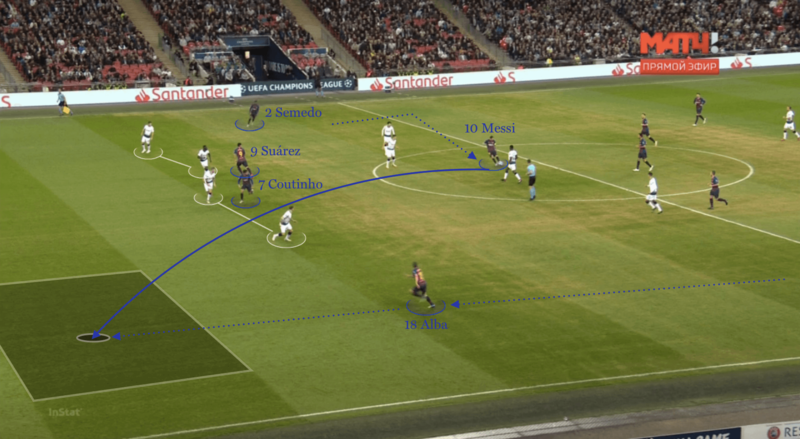 Lionel Messi’s superb through balls penetrated Tottenham’s back line throughout the game – as shown here for their opening goal. Barcelona adopted an asymmetrical 4-4-2 structure when defending, with Messi remaining high on the right and Coutinho dropping back into midfield. 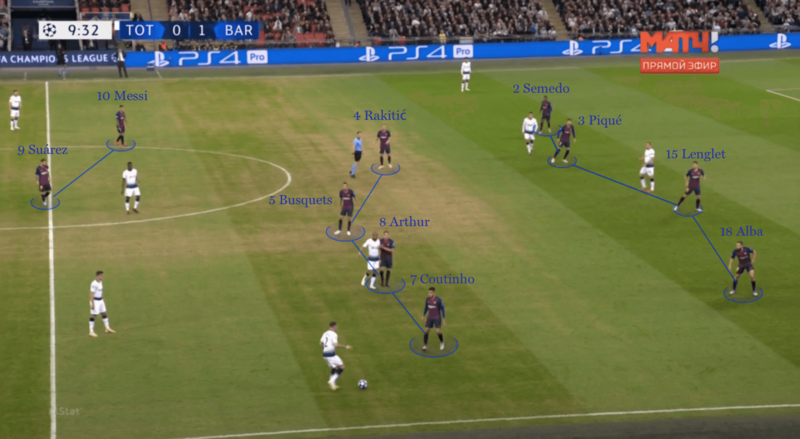 Before the introduction of Dier, Barcelona’s asymmetrical 4-4-2 gave Tottenham persistent problems. 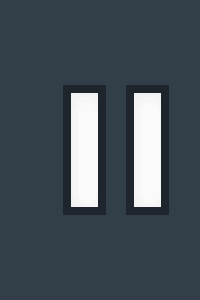 Messi and Suarez were particularly lethal during right-sided transitions. Ernesto Valverde made three changes from the side that comfortably beat PSV Eindhoven in their opening game of Group B. Nelson Semedo replaced Sergi Roberto at right-back, while Clement Lenglet replace the suspended Samuel Umtiti in central defence. 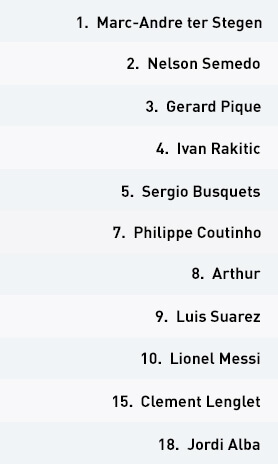 Arthur made his first Champions League start for the Spanish side, coming into midfield in place of Ousmane Dembele. The visitors started the game at a thrilling pace, with full-backs Jordi Alba and Semedo providing immediate attacking width. Philippe Coutinho narrowed the Tottenham back line by moving inside from his wide left position, and within the opening two minutes Alba was presented the space to get in behind the defence. A brilliant splitting pass from Lionel Messi found the left-back, who set the ball back for Coutinho to strike home after goalkeeper Hugo Lloris had needlessly charged out of his goal. Their early lethal play in possession soon reduced, as Spurs looked to maintain safe possession within their own half to take the sting out of the game. Kieran Trippier became a key outlet for the hosts from his right-back position, while the deep positioning of left-back Ben Davies reduced the space into which Messi could drive. The Argentina international still became the orchestrator in midfield, with the timing of his pass release outstanding. He combined brilliantly with Luis Suarez in progressing the ball across midfield, and regularly looked for the mirrored inside runs of Coutinho and Alba’s progress in the far wide area. When the option to play forward wasn’t readily available, Barca utilised their ball-playing central defenders and goalkeeper to maintain possession. The fluid central midfield rotations from Sergio Busquets, Ivan Rakitic and Arthur provided alternate short options, and they regularly had a different central midfielder dropping between the expanding central defenders to receive the first pass into midfield. 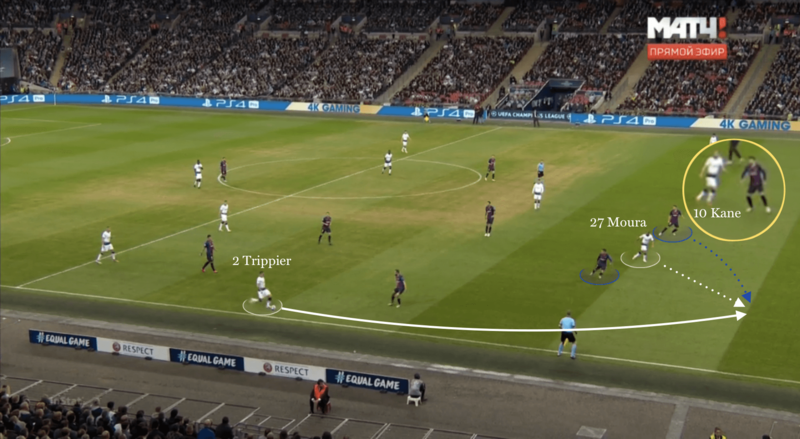 This significantly reduced the effectiveness of their opponents’ man-marking scheme, as they couldn’t predict or recognise which midfielder the pressing trap should be set upon. 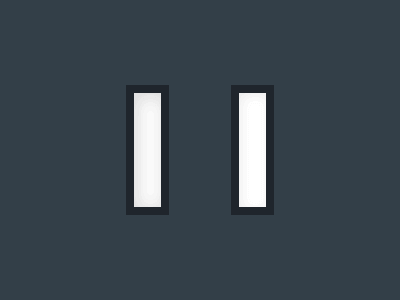 Another outstanding ball in behind from Messi – who had once more drifted across to the left side – saw Barca double their lead shortly before the 30-minute mark. Coutinho’s attempt on goal from Suarez’s knockdown eventually found Rakitic on the edge of the penalty area, and the Croatian rifled home a spectacular effort on the volley. The visitors maintained the majority of the ball until half-time, as the constant movements of their midfield unit ensured a passing option was always available. 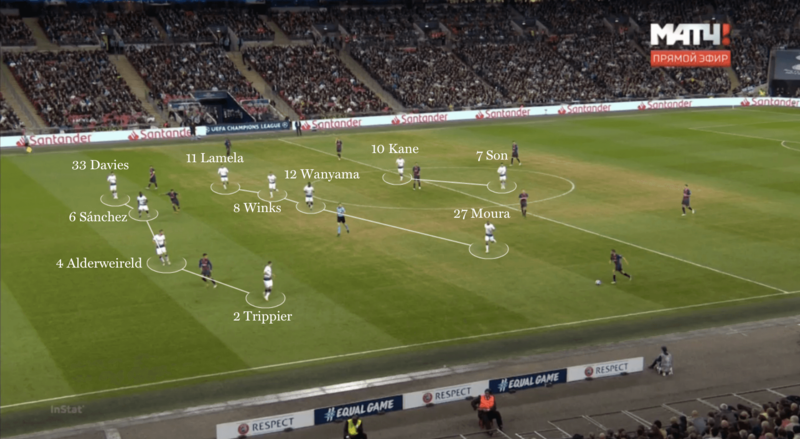 Their dominance continued into the second half, with their asymmetrical 4-4-2 shape causing problems for Tottenham, particularly during moments of transition. Messi hit the post twice in the opening exchanges, as his combination play with Suarez was proving too much for Spurs’ back line to contend with. They were punished for not taking these chances, however, when Harry Kane grabbed a goal back seven minutes after the restart. From here, the game descended into periods of uncertain possession play, but order was eventually restored. Messi finally found the back of the net with a cushioned effort after Suarez had expertly dummied a Jordi Alba cross. Tottenham reacted by immediately introducing Eric Dier to provide more defensive stability – and his presence was effective in reducing Barca’s attacking play. The hosts scored a surprise second through Erik Lamela and Barca found it increasingly difficult to counter effectively, as extra bodies blocked off vital spaces. But while Tottenham were recovering in good numbers, Messi’s inside movements from the left were still causing problems. The left-sided combinations between Messi, Alba and Coutinho offered Barcelona an attacking outlet as they set out to kill any Spurs momentum. Having withstood a final spell of Tottenham pressure, Barca secured the win. 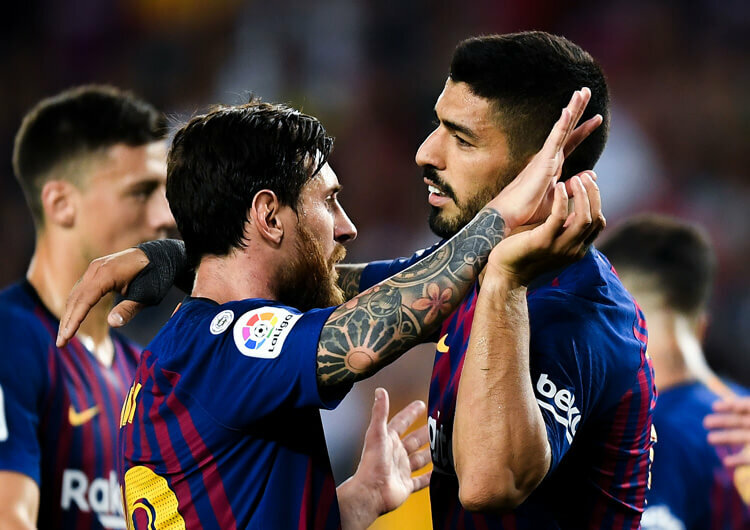 Another excellent dummy from Suarez worked the ball to Messi via Alba, who slotted home from close range to confirm a second win from two Champions League fixtures – and leave Spurs pointless.